and a general lack of societal appreciation for the value of landscape. However, things are changing. Through their training and practice Landscape Architects are intelligent, creative, multi-disciplinary professionals, experienced in collaboration and generally passionate about ensuring quality in the design, construction and maintenance of landscapes both in urban, rural and indeed all environments. The profession is acutely aware of the need to manage change as our landscape is constantly evolving or subject to external pressures. Landscape Architects prefer to be proactive rather than reactive. The Landscape Architect community is active on many fronts, with the Irish Landscape Institute representing its members both nationally and internationally through its membership of the International Federation of Landscape Architects. The ILI currently represents over 160 members working toward increasing quality standards, facilitating professional development, raising awareness and supporting collaboration between related disciplines. To gain a greater insight into the domain, I spoke with the current ILI President and Principal landscape Architect with the Railway Procurement Agency, Tony Williams MILI. B. You originally trained as a botanist, why the switch to landscape architecture ? T: It was more a development really and not a switch. One of the routes to becoming a landscape architect is to do a Masters of two years after obtaining a Bachelor Degree in a related discipline. I completed the Masters at University College Dublin in 1998, The course was still in its fledging state but was an exciting and rewarding time and I would sincerely thank Dr Desmond Fitzgerald for his tutoring and the gift of insight into landscape architecture along with the other tutors including Dr Karen Foley, current head of Landscape Architecture. B. How do you feel your formative training has informed your landscape work? The Masters is structured to ensure that the skills necessary for both design and construction are learned in a coherent manner. After graduation there is also the professional practice period of a minimum of two years and the requirement to sit professional practice exams. Overall the education and training is designed to ensure a well rounded professional capable of all stages of work and with the ability to create functional yet beautiful landscapes. B. You work as Principal Landscape Architect for the RPA. What are the challenges and rewards of the position? Working on city wide projects in an engineering-led environment is challenging. We must redesign the streetscape to accommodate the tramways and usually have to reconstruct the street from façade to façade. There are not many jobs where you get the chance to change the streetscape in such a dynamic way. My hope is that it is always a positive change. One of the challenges is also to balance functionality of a mass transport system with the requirements of a city to be beautiful. We try to use high quality finishes whilst also being aware of the need not to squander much needed funds. B. I mentioned a number of factors I consider to limit the evolution of the profession in Ireland. What are your thoughts on this subject? We are working on many of these issues and through the work of our members and colleagues in related disciplines I feel we will address them. Of course, some issues will take time and require us to deal with the regulatory authorities. We also work very closely with our colleagues in IFLA and particularly IFLA Europe so many of the solutions will be developed in tandem with our European colleagues and through the European institutions. B. While the challenges may be many, the potential value which Landscape Architects can bring to Ireland are far more numerous. Which do you feel are the most pertinent? B. There is much criticism of Landscape Architects that they do not do enough to promote the use of Irish plant stock in their work. Is this criticism well founded? I think we tend to specify plant material and hard landscape materials with a view to functionality and would always hope for an Irish supplier. However, in general, the procurement of materials is covered by contractual issues and so perhaps it is the contractual environment that requires to be reviewed and amended if possible. Of course procurement rules within Europe sometimes may mitigate against this. It would be my hope that the new structures we are discussing among the fledgling Irish Association of Landscape Industries might address this issue. B. Following from the last question, how would suggest Irish growers better engage with the Landscape Architecture community? We need to work together and it is a two way stream. We need to give enough lead time to allow Irish growers to prepare the stock. We also need some way of ensuring more appropriate and adequate lead times and matching this to the supply chain. It’s a challenge but one we must tackle as locally sourced plant material will establish better as it is grown to suit our conditions. I’m sure the horticulturists will tell us more. B. How do you respond to the critics who say Landscape Architects (generally speaking) are very weak when it comes to plant knowledge? I would say that in some cases this may be true and in my own case a knowledge of botany is not necessarily translated into good horticultural knowledge but does provide an appreciation of the discipline required. I tend to always collaborate with horticulturists or ‘pick the brains’ of landscape contractors and nurserymen and women. Detailed plant knowledge comes with time but I would also suppose that perhaps more emphasis is placed on students to learn before practicing. B. Through your role with the International Federation of Landscape Architects (IFLA) and in particular IFLA Europe, you are heavily involved in the advancement of Landscape Architectural education. From this perspective, can you provide some insight into how the domain is evolving? Right now, we are trying to prepare a common education platform that will allow us to regulate the profession and gain acceptance within the Professional Qualifications Directorates in Europe. IFLA Europe covers the Council of Europe area and European Economic Area, so includes from Iceland to Russia and Finland to Turkey. Our challenge is to ensure that our profession is trained to suit the wide variety of tasks we undertake and also that there is a common thread. We are focusing on ensuring the core disciplines are provided and also that advanced competencies are allowed for in what is a diverse education system when considered within the IFLA Europe jurisdiction. We work closely with colleagues from the IFLA world, and are gaining recognition by virtue of the quality of our graduates and the work of our professionals. A recent paper gives some of my thoughts on landscape education. B. What are the foundations of a top quality education in Landscape Architecture? In general, the courses must have a practical basis and ensure the core and advanced skills are taught. We have a project within IFLA Europe, stage 1 of which is complete. This analysed the possible currilula and the courses which form the core skills of discipline. B. How would you like to see educational provision evolving in Ireland over the next decade? I’d like to see the further development of the courses in UCD. We have a very good four year Bachelors course and a Masters programme. We need their energy to ensure we remain a vibrant profession here in Ireland. There may also be scope for modules within courses in landscape and perhaps collaborative education projects that link the various landscape professionals i.e. Landscape Architects should appreciate the knowledge of Horticulturalist, Nursery Stack Growers, Landscape Contractors and vice versa. It would be good to see more graduates being able to stay and work here, and form part of the ILI. But many of them emigrate. We need their energy, to ensure the Irish profession remains vibrant. B. Why should landscape students become members of the ILI? It is their link to their profession in Europe and worldwide through our links to IFLA. We are also working towards recognition of the profession and thus ensure members have the professional recognition and legal standing that we/they deserve. B. Despite the efforts of successive ILI councils, the lack of legislative recognition and protection for the name, Landscape Architect, the title remains stubbornly illusive. Why is this and what is the current state of play? B. The Institute has played an important role in the formation of the long overdue National Landscape Strategy (NLS). How do you feel this strategy will impact on the profession? The strategy is a requirement of the European Landscape Convention agreed in 2000 by the members of the Council of Europe and ratified by Ireland in 2004. The NLS is still a draft so we will be lobbying for its implementation. If implemented in a coherent manner it will not just benefit our profession but will make a significant contribution to enhancing and protecting our landscape whilst ensuring responsible development. B. It’s been said that the field of Landscape Architecture landscape architecture is currently having a crisis of identity. What’s your take on this? I have no such crisis of identity but would say we have much to do in order to raise the profile of the profession and ensure we are identifiable. B. What are your personal thoughts on what the newly formed Irish Association of Landscape Industries (IALI) can achieve? We have long discussed the possibility of joining together as an industry and our recent efforts will be worthwhile in the long term. We have had a few exploratory meetings and I believe we are setting the stage for a vibrant and dynamic landscape industry. The members of the IALI as landscape professionals are best placed to design, construct and manage the landscape, and the participants in the newly formed association are the key players. We still have some way to go to ensure we develop the systems and procedures and indeed the bureaucracy to ensure that the profession are in control of large and small scale projects. There are many examples where the landscape design is produced by us as designers but not translated into actuality due to the procedures involved in procurement and the fact that we as an industry can be somewhat removed from signing off on the overall contract work. We will be striving for a formality to be established which ensures that materials and workmanship are signed off by the appropriate landscape professional on all stages, from design to planting, supply to construction and to post completion maintenance, with the overall aim of ensuring that our initial vision is translated into actuality. B. 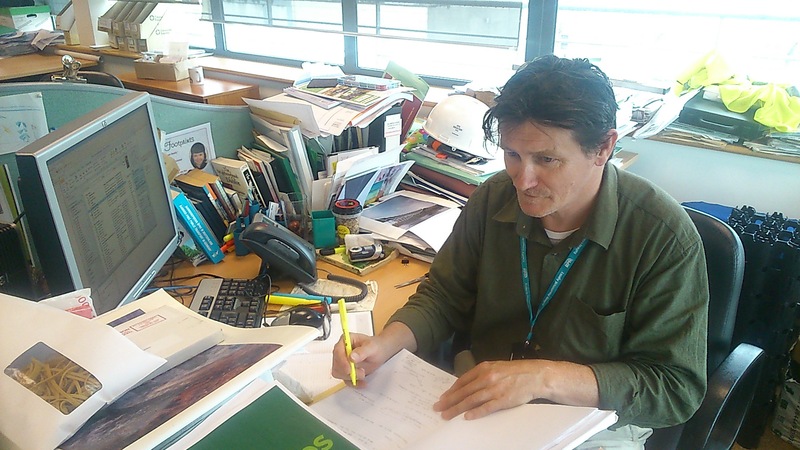 What advice would you give to someone exploring a career in Landscape Architecture?